"As long as I have one breath left, I will speak sutras, and propagate the proper dharma." This is the vast vow of Venerable Master Hsuan Hua. Master Hsuan Hua spoke sutras tirelessly for decades and delivered numerous dharma talks throughout his youthful years in China, his middle age in Hong Kong, and the many years since his arrival in America in 1962. The Master would give the full lecture regardless of the size of the audience, which varied from one person to a few hundred people. On June 17, 1968, in the San Francisco Buddhist Lecture Hall, the Master launched the Surangama Sutra lecture – a landmark of the Master's propagating dharma in America. This sutra is a sure sign of the proper dharma, it is the first sutra that will disappear when Buddha Dharma is about to end. The Surangama Sutra is the esoteric key to the Chan School, as well as the principle of the Exoteric Teaching. Ordinary people who cultivate according to the sutra can turn their ordinary minds into sagely wisdom; Bodhisattvas who realized it can cross living beings of different potentials over to the Buddha's vehicle. The Master started out by speaking this sutra in order to break our ignorance, rid us off afflictions, egoism, love and desires, showing us how to sail across the sea of karma. It serves as a compass for the confused and a lamp to light up the darkness. The Summer Study and Cultivation Session lasted for ninety-six days; over forty college students attended the session. Initially, the daily talks which included translations were scheduled for two hours only. The Master felt that the Sutra could not be completed this way. So an afternoon talk was added aside from the evening hours. Soon lectures were increased to three times – morning, afternoon, and evening. Towards the end, lectures were increased once more to four times daily -- one in the morning, two in the afternoon, and the last one in the evening. With all the efforts, the first summer session concluded on September 22. More and more people came to study Buddhism after the Surangama Assembly. Most of the summer students were from Seattle, Washington. The same momentum pulled them together, like magnet to iron. It was indeed unconceivable! They all moved to San Francisco in order to attend the Dharma Flower Dharma Assembly. The Master explained the Wonderful Dharma Lotus Flower Sutra every evening for two years straight in over three hundred fifty lectures. The Assembly completed on November 10, 1970. The Sutra illustrates that "All Buddhas and the World Honored Ones appear in the world solely for the causes and conditions of one paramount matter," that is, "to demonstrate and enlighten living beings to the Buddha's knowledge and vision." The Master talked about this sutra in order to inspire us ― to open the Buddha's knowledge and vision, to demonstrate the Buddha's knowledge and vision, to enlighten living beings to the Buddha's knowledge and vision, and to lead living beings to enter the Buddha's knowledge and vision. This is ample evidence of the greatness of the Master's the compassionate vows. 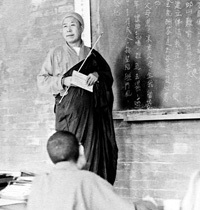 Starting November 16, 1968, the Master added lectures on The Past Vows of Earth Store Bodhisattva on Saturdays. The Assembly was completed on September 29, 1969. "Not until all living beings are delivered, will I myself accomplish Bodhi; not until all hells become empty, will I realize Buddhahood." – These vast vows of the Earth Store Bodhisattva awaken our conscience. We should all resolve to make great compassionate vows as well, to liberate the living beings in the West of extreme material abundance as well as of extreme spiritual poverty. At the earnest request of his disciples, the Master embarked on lectures of The Vajra Prajna Paramita Sutra in the afternoon starting on November 17, 1968. The goal was to enlighten us to the knowledge that three kinds of thoughts are unattainable; and that we should let the thoughts be nowhere attached, that is to see through, to let go, and to be free. The Prajna Assembly concluded on April 6, 1969. The true mind itself can merge with enlightenment's source. Dharma and analogy comprises its title, which transcends the relative. Empty of the characteristics of all dharmas is this substance beyond words. And by using its power of eradication, the three obstacles are cleansed away. A maha turning around: this is the prajna boat. Practice the Way, cultivate yourself, and do not seek outside. The prajna of your own nature is the deep and secret cause. Nirvana, the other shore, effortlessly is climbed. Now it's there, now it's not — see what is originally esteemed. This Assembly began on April 20, 1969 and concluded on July 27, 1969. For all living beings to obtain peace and happiness. For eradicating all evil karmas and heavy offenses, and being free of obstacles and disasters. For increasing merits and virtues of all White Dharmas. For accomplishing all good roots, and leaving behind all fears. For quickly fulfilling all needs and wishes. The Master wanted us to learn what the Buddha learned, to do what the Buddha did, to have great kindness and compassion; to do what's difficult to do in this evil world of five turbidities; to bear what's hard to bear -- to exert utmost efforts in practicing the Bodhisattva way. The master instructed us not to just move in and out of sutras; instead, we should take action and put principles into practice. This is how to reveal the true spirits of the Buddhas and Bodhisattvas, and to enable Buddhism to take root, sprout, bloom, and bear fruits in the West. Besides, the Master also wanted people to know -- what indeed is Buddhism? The second Buddhist Study Summer Session began on June 16, 1969. In the afternoon, the Venerable Master lectured on the Chapter on the Universal Worthy's Conducts and Vows from Buddha's Flower-Garland Sutra of Great Expansive Teachings (Avatamsaka Sutra). In the evening, the Master continued with the Wonderful Dharma Lotus Flower Sutra. The ten great vows of Universal Worthy Bodhisattva, is no different than exhorting all Buddhist practitioners to bring forth a mind of reverence, perseverance，fearlessness, kindness and compassion, and great resolve --- in learning and practicing the Ten Kings of Vows of the Universal Worthy. The Venerable Master often encouraged us to cherish the spirit of sacrificing for the Dharma, especially in this country, and to work hard for Buddhism based on the strength of great conducts and vows. The Lecture on Chapter of Universal Worthy's Conducts and Vows was complete on July 25, 1969. Starting August 4, 1969, the Venerable Master conducted an afternoon lecture series on The Sixth Patriarch's Dharma Jewel Platform Sutra, which concluded on September 12. Chan School is characterized by special transmission outside the scriptures and independent of words, aiming at pointing directly to the mind: seeing into one's nature and thereby attaining Buddhahood. The Sixth Patriarch's Dharma Jewel Platform Sutra emphasizes that all beings are Buddhas, no differences exist originally in their Buddha nature; one needs simply use this mind to straightaway accomplish Buddhahood. Outside of the mind, there exists no other Buddhahood. The Venerable Master repeatedly told us: "Do not seek after Buddha Dharma or Buddha Way outside your own minds；Apart from your minds, no Dharmas can be attained." The Master's words are medicine for the audiences, so that they can leave behind the views and attachments, and directly enter the Buddha Way. The Venerable Master's tireless devotion in propagating the Buddha-dharma moved the disciples. With deep faith, they vigorously worked on realizing the truth. In 1969, the Master's five disciples of American nationality sought full Buddhist ordination at the Haihui Monastery, Keelung, Taiwan. Upon their returning to the United States, these five disciples became literally the first Bhikkhus and Bhikkhunis in American Buddhism. During their leave from the United States, the Dharma Flower Dharma Assembly stopped temporally; instead, the Master scheduled the Amitabha Dharma Assembly. Herein the Venerable Master focused on the importance of faith. Faith is the origin of the Way and the Mother of merit and virtue; it gives birth to and nurtures all good roots. To cultivate the Pure Land Dharma Door, one must be complete in faith, resolve, and conduct, single-mindedly and sincerely reciting Namo Amituofo. At the end of life, the Buddha and the sagely assembly will all come to receive and lead the way for this person to be reborn in the Land of Ultimate Bliss, and the person will no longer suffer the cycles of life and death. This dharma assembly began on October 29, 1969 and concluded on December 25. Subsequently in 1970, the lectures resumed for The Wonderful Dharma Lotus Flower Sutra while a seven-day Chan Session and an Amitabha Buddha Recitation Session was conducted respectively. During these events, the Venerable Master, in simple and lively language, talked in depth about the essence for both sessions. Between May 17 to June 7, 1970, the Venerable Master gave talks on The Shastra on the Door to Understanding the 100 Dharmas. This is the basis for the Consciousness-Only School; it is one of "the eleven Shastras that establish Principles", as well as Buddhist psychology. On the surface, it is analysis of names and forms; in reality, it tells us clearly the shapes, functionalities of human sense organs, as well as their interrelationships; it also enables us to become acquainted with some terminologies of the sutras. The Venerable Master continued on The Wonderful Dharma Lotus Flower Sutra during the third Buddhist Study Summer Session. From November 15 through February the following year, there were fourteen weeks of Chan Meditation, which started at 3 a.m. and ended 12 midnight each day. During this "100-Day Chan" session, the Venerable Master spoke about the greatness of the past high monks from Biographies of High Sangha, as well as the purpose and methods of sitting meditation. All participants benefited tremendously. On a weekly basis the Master gave nine dharma talks in all, on weekday evenings and on Saturday and Sunday afternoons. During this period, we founded Gold Mountain Chan Monastery, and did a significant amount of remodeling of the interior, turning it into a Buddhist Way Place. Gold Mountain Monastery also became the new headquarter of the Sino-American Buddhist Association. Starting on April 18, 1971 The Venerable Master lectured on The Shastra On the Awakening of Faith in Mahayana, urged us to aspire for pure faith in Mahayana, cutting off dark doubts and wrong attachments, ensuring the universal continuance of the lineage of Buddhadharma, never for a moment letting it stop. On June 13 the same year, the fourth Buddhist Study Summer Session opened. The Venerable Master embarked on talks on Buddha's Flower-Garland Sutra of Great Expansive Teachings (Avatamsaka Sutra), spoken by Shakyamuni Buddha to the Great Knights of the Dharma Body during the first 21 days of his enlightenment. The Venerable Master adopted Qing Liang National Master's Commentary on the Avatamsaka Sutra. The Venerable Master began with The Preface to the Flower Adornment Sutra Prologue, and then moved on to The Flower Adornment Sutra Prologue. The Master lectured every day for one year and five months – three hundred and seventy-five lectures in all. The lecture series concluded on November 10, 1972. He immediately started lecturing on the sutra text of The Avatamsaka Sutra on November 12, nine lectures weekly. The Avatamsaka Assembly concluded in November 1979. The lectures lasted nine years with dharma assemblies totaling over a few thousand. This great Sutra of the dharma realm aims at manifesting the fundamental dharma wheels, and is mother of all sutras; the immense teachings manifest the state of flower store through the "Dharma Body Vairochana" at fruition, the "Ten Lotus Flower Store Sea of Worlds" as the retribution state, the "Universal Worthy's Compassionate Vows" as causal conducts, and the "Ten Ten Inexhaustible, Perfect and Harmonious Great Dharma" as dharma-doors for cultivation. This sutra can be said to be the summit of all the Buddhas' sublime and wondrous wisdom and its function, while completely revealing all kinds of nature and phenomena, principles and specific matters throughout the universe; the sutra in itself, is also a collection of all the essential dharma-doors for cultivating on the mind-grounds. This time period witnessed the establishment of the International Translation Institute – women branch in San Francisco, the Gold Wheel Monastery in Los Angeles, and the City of Ten Thousand Buddhas in Dharma Town, City of Ukiah. From 1976 on, with the compassionate vow of rising above himself for the Dharma, the Venerable Master worked tirelessly in propagating the dharma at these way places, liberating the multitude. In 1978, the Master re-opened talks in Gold Wheel Monastery on The Past Vows of the Earth Store Bodhisattva. Starting in 1972, the Venerable Master adopted The Portraits of the Buddhist Patriarchs to teach the disciples to learn from the spirits and virtues of the past patriarchs. This book is literally a collection of the portraits and an account of the spiritual journeys of the patriarchs in the east and west, who are mentors for cultivators of later generations. It encourages cultivators to "keep abreast with the virtuous". The book may be traced back to Ming and Qing Dynasties. 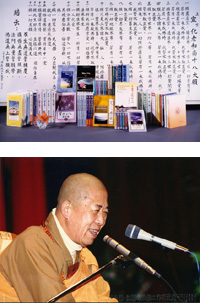 Elder Monk Xu Yun, a modern high sangha, made additions to the book as he regarded this book to be highly valuable in the history of Chan School. 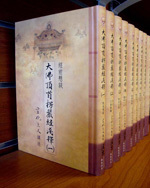 Following Elder Xu, Venerable Master Hua expanded the book to include accounts of modern high sanghas. The Master also added commentaries and outlines in the form of verses that is simple and easy to understand. The Venerable Master gave a series of talks on the noble deeds of the great virtuous patriarchs. The talks concluded in the spring of 1986. 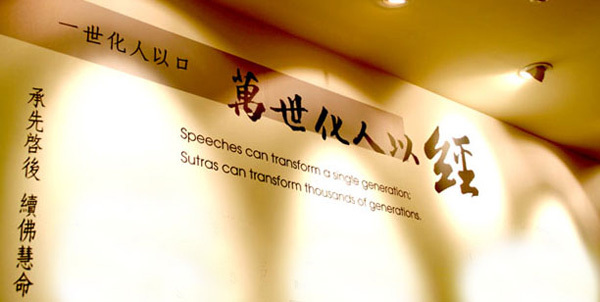 In 1974, the Venerable Master opened talks on the Sutra in Forty-Two Sections Spoken by the Buddha, the earliest Sutra translated in China. In simple and lucid language, the book in forty-two short chapters clearly states the step-by-step process of cultivation, from leaving home-life, cultivating the Way, up to becoming sages. It also points out precisely the dos and don'ts for cultivators. In the same year, the Master further lectured to his Western disciples on The Shramanera Vinaya and Rules of Deportment, preparing them for their future responsibilities being mentors to men and gods, as well as to carry on the Tathagata's lineage. Precepts are the life and blood of the left-home people; therefore they receive the Ten Shramanera Precepts in the first place, and then proceed with learning rules of deportments. Also in 1974, the Venerable Master led the two American disciples Heng Ju and Heng You, who in early days went through the Three Steps One Bow Pilgrimage, in the visits propagating dharma in Taiwan, Hong Kong, Thailand, India, Srilanka, Singapore, Vietnam, and various places in Japan. During the visits, the Master gave talks in various temples, monasteries, and universities. In addition, the Master held a seven-day Buddha Name Recitation. Towards the year end, the Master, in response to an invitation, delivered talks on the Chapter of Pure Conducts from the Avatamsaka Sutra. This Chapter teaches us how to make good use of our minds in our daily lives. If we can expediently make good vows in what we do, and carry out our actions according to our vows, then we can guard our minds against scattered thoughts and increase the compassionate and wise deeds of the Bodhisattvas. Upon completion of the Chapter of Pure Conducts, the Master was again invited to Southern Taiwan to give talks to the faithful on the Chapter of the Perfect Penetration (from the Shurangama Sutra). The Buddha name recitation dharma door benefits living beings of all three roots; both the sharp and the dull-witted living beings will receive responses. As the sutra says: "If all living beings in their minds, remember and recite the name of the Buddha, at present or in the future, they shall see the Buddha." The Venerable Master explained in plain language the true meaning of reciting the Buddha's name – that is to "gathering in six sense-faculties through continuous pure mindfulness." In the year 1978, the Venerable Master traveled to Malaysia to propagate the Dharma. He was enthusiastically greeted throughout the trip –-- an unprecedented grand occasion. The Master delivered talks during his various visits; he also lectured on the Earth Store Sutra. The Shurangama Mantra is the most important mantra in Buddhism. It is the King of mantras, also the longest among mantras; it is critical to the rise and fall of Buddhism. The Shurangama Mantra is the efficacious text that keeps the sky and the earth from destruction. And the Shurangama Sutra was spoken for the sake of The Shurangama Mantra. For this reason, starting in 1979, the Venerable Master took the unprecedented step of explaining the Shurangama Matra sentence by sentence with verses. This Shurangama Mantra with Verses and Commentary lasted for nine years, it concluded in 1987. Exhortation to Bring Forth the Resolve for Bodhi was written by the great master Xing An during the Qing Dynasty. The work classifies "resolve" into eight types --- evil versus righteous, genuine versus fake, great versus small, partial versus perfect --- with lucid explanations on the differences among the eight types of resolves. The essay, with its thorough reasoning, is a very important guide to cultivation. For this reason, the Venerable Master lectured on the essay twice, in 1979 and 1985 respectively, urging his disciples to bring forth great bodhi resolve, to make solid vows, to be true and to get rid of falsehood, and to return to enlightenment and leave confusion. In 1979, at the request of the faithful of the Gold Wheel Monastery at Los Angeles, the Venerable Master lectured on the Sutra of the Buddha's Bequeathed Teaching, this is the Buddha's final exhortations to the fourfold assembly of disciples. The sutra reminds us how to cultivate, how to reduce desire and be content; how to rely on precepts, samadhi, and wisdom to realize the Way; so that we don't remain asleep and idle away our lives. Upon conclusion of the Sutra of the Buddha's Bequeathed Teaching Assembly in 1980, the Master began talks on the Earth Store Sutra at the Gold Wheel Monastery. In response to another request from the Los Angeles faithful, in 1983 the Venerable Master gave lectures on the Medicine Master Sutra. The Medicine Master Buddha had made vows to eliminate the afflictions of living beings, to keep them from suffering illnesses, to eradicate calamities and perils. Besides encouraging us to be reborn in the Pure Land upon life's end, the Medicine Master Buddha Dharma Door emphasizes that by the power of vows of the Medicine Master Buddha, the faithful can obtain peace and happiness in their present lives, increase their blessings and life span, and remove the many obstacles along the path of cultivation. Yong Jia Great Master's Song of Enlightenment reveals the Great Master's understanding through his lifelong cultivation. He wrote this song upon his enlightenment to guide later generations. The song is simple and straightforward in language. Each word is a gem and every line reveals the truth. It inspires in us the Bodhi resolve and shines the light of wisdom on its readers. In 1965 the Venerable composed Commentary to Great Master Yong Jia's Song of Enlightenment. He subsequently lectured on this song a few times. The dharma assembly in 1985 at the Gold Wheel Monastery was one of these talks. From 1983 onward, to train his disciples in dharma talks, the Venerable Master established a training course "Developing Inherent Wisdom". The disciples took turns by raffles to explain sutra texts before the class, the Master appointed people to give critiques, and the class would end with the Master personally giving commentary and summary. This method to explain sutra texts is unprecedented, and all participants can contribute their understanding, share their feelings and present their wisdom. The classes lasted a long time till well up to the 90's. During this period, the Master lectured on The Analects (Lun Yu by Confucius) through Chapter Nine – Zi Han, teaching his disciples the fundamentals of conducting themselves in the society. (Part of) The Nirvana Sutra was also lectured. The doctrine of The Nirvana Sutra is to "support the precepts and speak about the eternal", that is, to support the precepts and to teach about the eternal Buddha Nature. As an exhortation to the disciples, the Master also lectured Chapter One of the Shurangama Sutra. For the disciples who experienced these days of studying and practicing the dharma with the Master, it was like being in the land of ultimate bliss; it was such a wonderful and memorable experience! During the 80's, at CTTB and Gold Wheel Monastery, the Venerable Master held a conference for discussion and translation centering on "Shurangama Sutra – The Fifty Demonic Skandhas". The Master's fourfold assembly of disciples attended the conference. The Master explained part of the fifty demonic skandhas during the meeting and gave some instructions to help his disciples tell the state of these skandhas. Because, if cultivators do not understand these fifty demonic skandhas, they will take the wrong path! After the 80's, the number of way places increased under the Master's leadership. Over twenty monasteries spread across America and Canada, and in part of Asia and Australia, among these are Gold Summit Monastery, Gold Buddha Monastery, the Avatamsaka Monastery, City of Dharma Realm, Berkeley Monastery and Gold Sage Monastery. Still, the Venerable Master continued on working tirelessly, sweating blood, sacrificing himself for the dharma, compassionately crossing over living beings, lecturing sutras and speaking the Dharma. He would not rest! The Venerable Master, being one of the Great Virtuous Buddhist Patriarchs, was well versed in the Chinese classics of Four Books and Five Classics, and the Hundred Schools of Thought. He was also erudite in Chinese medicine, divination, astrology, and physiognomy, etc. Besides lecturing on sutras and biographies of great patriarchs, the Master also taught his disciples knowledge for daily life. For example in 1975, he talked about the Nature of Chinese Medicinal Herbs, teaching his disciples simple applications of common herbs. Reflections in Water and Mirrors is an important work of the Venerable Master's. In an upright spirit, the Master rendered straightforward critiques based on historical facts, his judgments on the ancients offer precautions for contemporary people. The master mentioned the intention to rescue history from its vast destruction; but as the moon in water and as flowers in the mirror, doing so is like shadows without substance. But even as unreal and hopeless as such, the Master intended to make his efforts to do what's impossible, and this is the cause for the Master's book. Talks on the book was given by the Master in the 70's, the lectures lasted till 1988. In addition to speaking sutras, the Master delivered numerous talks throughout his daily dharma propagation. The Master's timely teachings are dharma speeches of wisdom; simple in language and with acute insight, these speeches are our directions to cultivation and a treasury by which to conduct ourselves. His Q & A sessions, full of witty remarks, instantly removed doubts in the audience. Poems, couplets and songs verses total over 2000 pieces, and are among the variety of dharma-doors that the Master used in transforming and guiding living beings. These simple dharma expressions that the Master had at hand reveal the quintessence of sutras, mantras, essays, and biographies. Shakyamuni Buddha spoke the dharma for forty-nine years in over three hundred lectures, bequeathing the world with countless dharma treasures. The eighty-four thousand dharma doors opened up by the World Honored served only to cure the eighty-four thousand afflictions of the living beings. The Venerable Master, exhorted us earnestly time and time again and told us all the Buddhadharmas he had known, leaving behind countless Dharma treasures in the world. These Dharma treasures have been translated into English, French, Spanish, Italian, Vietnamese, Japanese, Korean, etc. 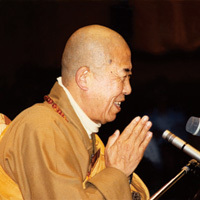 However, among his lifelong teachings from the Summer Shurangama Lecture and Cultivation Session in 1968 up until now (year 2012) – the 17th memorial of the Master's Nirvana – in over forty years, even with the disciples' continuous efforts in compiling and publishing, many of the Master's dharma talks remain unedited and unpublished in the Chinese mother tongue in which he spoke, let alone in other languages. His dharmas connecting the East and the West, his virtues filling heaven and earth, he had carried on the lineage of the patriarchs and had paved the way for the future; he had continued the wisdom life of the Buddhas through propagating the dharma, translating the sutras, and education. He had conducted himself in the true spirit of no fighting, no greed, no seeking, no selfishness, no pursuing personal advantage, and no lying. We hope that all who hear the dharmas will receive inconceivable moistening from the dharma rain --- those who have not planted good roots, let them plant good roots soon; those who have planted good roots, let their good roots grow tall; those whose good roots have grown tall, let their good roots ripen; those whose good roots have ripened, let them realize the Buddhahood of "permanence, bliss, self, and purity".